The Lucky man who purchased a winning Powerball ticket from The Knox County has claimed his Powerball jackpot prize worth $50 million nearly three weeks after the ticket was purchased. Michael Duncan claimed the prize at the Tennessee Lottery’s Nashville headquarters. According to a statement released Friday night, Duncan bought the ticket when he went to buy a soft drink. After seeing a Tennessee Lottery sign he decided to buy a Powerball ticket, even though he hadn’t done so at all during the past two years. Duncan purchased one ticket and picked numbers based on family members ages. The ticket matched all six Powerball numbers drawn on Saturday, March 21. 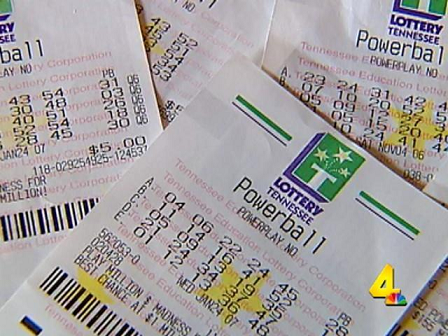 It’s the third largest prize in Tennessee Lottery history and the second Powerball jackpot in Tennessee in the last year. He thanks God for his good fortune. Duncan chose to receive a lump sum cash payment of $33,557,046.98 with taxes deducted instead of a $50 million annuity. Rocky Top Market will receive $25,000 for selling the ticket. Powerball winning numbers for Saturday, March 21, 2015 are 11, 16, 30, 38, 42. The Powerball number is 07. No photo was available because Duncan declined, according to lottery spokeswoman Kym Gerlock.